Sir Peter Maxwell Davies has published over two hundred works in every medium, many of which are continually performed all over the world. He was born in 1934 in Salford (now part of Greater Manchester). He lives in the Orkney Islands off the north coast of Scotland where he writes most of his music. He first visited Orkney in 1970, and the following year he settled in Rackwick Valley on the island of Hoy. 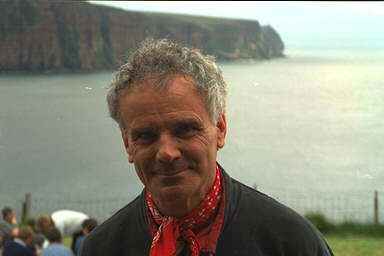 In 1988, he moved to the Orcadian island of Sanday. His major theatrical works include the operas "Taverner," "Resurrection," "The Lighthouse" and "The Doctor of Myddfai"; the full-length ballets "Salome" and "Caroline Mathilde"; and the music-theatre works "Eight Songs for a Mad King" and "Miss Donnithorne's Maggot." His fifty-six orchestral works include fourteen concertos; seven light orchestral works, including "An Orkney Wedding, with Sunrise" and "Mavis in Las Vegas"; three large-scale works for chorus, including the oratorio "Job"; and six symphonies. He is the Associate Conductor/Composer of the Royal Philharmonic Orchestra in London, the Composer/Conductor of the BBC Philharmonic in Manchester, and the Composer Laureate of the Scottish Chamber Orchestra. He guest-conducts orchestras both in Europe and in the United States and has thirty-six compact discs entirely devoted to his music. Future commissions include a Concerto for Horn for The Royal Philharmonic Orchestra and his Symphonies No. 7 for the BBC Philharmonic and No. 8 (Antarctica) for the Philharmonia Orchestra, as well as the on-going narrative of the fourteen orchestral works entitled "Sails in Saint Magnus" for the BBC Philharmonic, and a series of ten string quartets. The following interview was a backgrounder for a feature article that ran in the Pasadena Star-News in advance of Los Angeles area performances of two works of his - the Violin Concerto, performed by Isaac Stern and the Los Angeles Philharmonic, and the Little String Quartet No. 2, performed by the Alexander Quartet at a Coleman Chamber Concert in Pasadena. I spoke with Sir Peter Maxwell Davies on January 11, 1988. DB: Let me ask you about the Violin Concerto that is going to be performed here (in Los Angeles) by Isaac Stern. What can you tell me about it? DB: Oh yes, that's well known! PMD: - which has got a very strong folk fiddle tradition, and the piece has got quite a lot of folk fiddle elements in it from that particular region of Scotland. It's the kind of thing you hear when you go to a pub there, you know, where there's a fiddle or to dance and playing dance tunes. It's got a lot of that in it, particularly the tune in the slow movement. It could be a kind of folk tune although it isn't. DB: So you would say that this is actually a very listenable piece for your lay audience that might not be familiar with your earlier output. PMD: Well, I think it probably is. They played it for a performance at the festival in Orkney, and I think people did enjoy it very much. And I just conducted a series of performances of it myself with an orchestra in Holland with (Ernst) Kovacic, the player from Vienna, and I think people really said oh yes, they enjoyed that - that was fine. DB: Was that your first venture in the concerto form? PMD: That was my first. DB: And now I understand you're going to write ten more. PMD: Well, that's absolutely right. I think that I got bitten by the concerto bug. I got this offer from the Strathclyde region - that's the Glasgow region of Scotland - and they said, "Would you like to write some concertos for the principals of the Scottish Chamber Orchestra?" - which I have a connection with anyway. And I said, "You bet!" DB: Have you written the first one yet? PMD: I've actually written two of them! DB: You’ve written two. What, the oboe and? PMD: One for oboe and one for the principal cellist. DB: I guess we're going to hear that Oboe Concerto in Ojai next year - I mean this coming year, actually. DB: Are these classical forms something of an oddball for you to come to - writing symphonies as you’ve been doing for about the last 10 or 15 years - and now concertos? PMD: It's not something that I wouldn't have liked to have done before. I’ve always felt I didn't have the necessary technique to be able to control that kind of form. It's only the last 10 to 15 years, exactly as you put it, that I've had the confidence to think that, well yes, perhaps I can manage to say something with that very disciplined kind of formal thinking that the name symphony or concerto conjures up. One could write something and call it a symphony or concerto and it wouldn't have the discipline of form, and I don't think that would be anything but a cop-out. (Laughs). So I really do feel that this is something which can't help but be a challenge to a composer and a very worthwhile one, you see, if he's prepared to direct himself to the necessary compositional discipline. DB: It seems that you have a scholastic discipline that compels you to keep to traditional form. Are you making a concerted effort to stay within the constraints of, say, a Haydn or Beethoven? PMD: Oh, not at all. I think it's a question of perhaps understanding what they did and why those forms worked for them and applying elements out of their discipline to the situation that I find myself in. I think I can illustrate this by saying that I'm not all that good at writing development sections, and one could say that development is one of the - perhaps the most essential element in symphonic thinking. Perhaps some people would even define symphonic thinking as the capacity of being able to think developmental treatment for the material which you state. And while I would agree with that, I think that I've perhaps sidestepped any problem by subjecting the material to transformation processes rather than developmental processes. I think of many instances, particularly, as I want to use very often textures in orchestration and the art of working with phrase shapes and so on in the small form, kleineform - actually, I think these things in German as one’s spoken in German all one’s life - I think that those things, they show perhaps that yes, one is taking classical forms as a springboard but doing something which I hope is relevant to my own situation and to the situation of our time rather than doing any kind of neo-neo-classicism. I think that would be very boring. DB: Let me ask you about some of those transformational techniques. You have used a technique using magic squares. Can you shed a little bit of light on that? PMD: Well, you know that when you put numbers down in a certain order, say, 1 through to 81 and you arrange the numbers in a sort of order - in certain permutations of 9 - that if you go through those numbers and around the squares, they add up to the same number. If you write them down in a big square of 9 by 9, the squares (individual squares with a single number per square) will add up - if you add all the numbers up - to a number which is mathematically consistent throughout. Also diagonally and sometimes in other ways, too. If you use those old traditional magic squares - and I’m thinking of one that I’ve just been using - and you use that consistently, it gives certain symmetries because number patterns recur. It takes care of things like currents of notes. A phrase will balance itself. The notes will recur at a transition, and it's a very useful basis, a framework upon which to hang one's ideas. One thing I would like to point out, though, is that I don't sit there with a chart of paper in front of me working music with that. You learn the thing so that you can carry it around in your head; otherwise it would be tedious, I think, and a bit of a cop out. And that probably means that I sometimes make mistakes, which anybody really shouldn’t doubt. It's really an aid to composition and an aid in one's structure work and symmetries - both rhythmically and as far as the intervals go. It's not for the ornamental. DB: I guess I don't quite see how it works as a pitch device, but then one doesn't really need to understand it. PMD: I really don't think that one needs to understand, for instance, in the Bach Little E minor Invention in Two Parts, the thing is a pyramid shape symbolizing the holy Trinity, so you can enjoy it as an exercise on your clavichord or your harpsichord without that. DB: One more question about magic squares. Does it bring a little mysticism to your music or is it purely a mathematical device? PMD: I think it's probably both. But I think, too, one has to remember that numbers - one, two, three, four and so on up to probably nine, but certainly the first four - when they were originally used, I doubt whether they were used so much for counting as for their quality. I mean their almost religious quality. To actually count is already a magic thing. And numbers and certainly magic squares, they have got enormous magic quality and I think I'm very conscious of the magic of numbers. Although this does tend to become very debased when one counts one's change at the supermarket, but when you actually begin to think about the primary numbers and their application in computer techniques, then it again becomes magic. DB: Let me ask you about another work that we’re going to hear locally in about a week or so. The Alexander Quartet is bringing the Little String Quartet No. 2. There’s a little story about that, I hear, as to how that came about. PMD: Well, this was asked for by Hans Henze for his festival at Montepulciano in Italy. I wrote this piece - its first version - and copied it all out and I kept the sketch, and actually, because it was very, very urgent - in Orkney, of course, on the island there is no access to anything like a copying machine - I sent the manuscript, which promptly disappeared in the Italian post. So there was no performance of it there. Meantime, I somehow mislaid my sketches and they came to light again and I worked them over and made this particular piece. I did that quite recently. DB: The piece that was lost was the Little String Quartet No. 1, I presume? PMD: No. I’ve got the numbers mixed up now. I can't remember which is which. I wrote another one, and I can't remember which eventually Boosey & Hawkes called No. 1 or No. 2. (Laughs). I’m not sure it makes any difference. I knew once. DB: But this is the one that was lost in the post. DB: Early music figures very prominently in the large body of your works. Why is that? PMD: I’ve always very been very interested. Even in student days, I used to go along to the cathedral in Manchester in Lancashire where I was studying, where they’ve got a very nice medieval cathedral. They had a very good music director there in Alan Wicks, who’s now at Canterbury in the south of England. He used to do medieval music, and I really became hooked on this. It was I quite, quite fascinating to go to the university and chase after the published editions that I could find, particularly the big complete Oxford publication of Tudor English music. I became very, very hooked on that. Particularly, I remember borrowing for ages and ages the complete church music of John Taverner. DB: Who has figured quite large in your work. PMD: He eventually did. Yes. Ever since then, I have really been quite fascinated by that. Still to the extent - which I did just recently - of actually digging out some plainsong manuscripts, which I didn’t know where they came from. It turned out to have come from Portugal in the 15th century - and comparing the plainsongs from there with the standard one's from the Liber Usualis, noting the differences the and writing a piece using the differences. DB: Would you say that early music was the major driving force or basis for your compositional creativity? PMD: No, no. I think it's one of them. It's not the main one. DB: Let me ask you about the Fires of London. The Fires have now ceased to be an entity. Was that a difficult decision to disband? DB: So it was really a practical decision that brought about the end of the Fires. PMD: Yes. Particularly as we had done some pretty ambitious productions and into these, I’d had to pump quite a lot of money. And especially as in Germany and Scandinavia and so on, these pieces are put on by the opera houses now and they’re doing the rounds and doing quite nicely, I thought, well perhaps this has also - as well as eating up my private money coming in from whatever royalties I get - it’s outlived its function. Never mind in Britain were things don't get done, but in Europe they do. DB: Let me ask you about Orkney. What’s the place like? PMD: Well, you probably know that it’s a windswept group of islands off the north of Scotland. Pretty barren. Pretty remote. It has a long tradition of being rather independent from Scotland together with Shetland because it was Norse colony, an old one belonging to Norway until the late 1400s. And then it became Scottish and then it came under the jurisdiction of Westminster in London. But they’re still very independent. It's got many cultural features of its own and a very good literary tradition of storytelling and more recently, of actually producing novelists and poets like Eric Linklater, George Mackay Brown, Robert Rendall. Quite a few of them. And also, it's got quite good folk music tradition as far as fiddle playing goes. Most importantly of all for me, ‘twas a place which had an extraordinary kind of magic that was silent. One could hear nature. One could hear the heather rustle. One could hear the waves from the sea. And you didn't have engine noise. The house that I have is way away from any road. It's inconvenient in that you have to carry everything a mile on your back along a track. You can't even get a bike up it. I like it up there in that it is remote and it has this extraordinary magic in what you hear - the sounds of nature - and in the light, which is always quite extraordinary as I have it on a cliff overlooking south. I think the next land west is the coast of America. It does have that extraordinary kind of magic, which I think is as magic a place as you'll find in the whole of Great Britain. DB: And that's where you do all of your writing. PMD: That's where I do my writing, and of course, I did - with the festival there - become very involved with the local community. DB: How big is the local community? PMD: Where I am on Hoy - the community there in the north part of the island, which is separated by about 25 miles from the other end of the island, and they hardly speak to each other - there are 30 people. On the mainland of Orkney - that's the largest island, which is a half hour boat ride away - there must be… Well, there are two towns. There’s Kirkwall, which has about thousand people and Stromness which must have about 3000 now. Those are the two towns, and there are some villages. DB: But your community only has 30 people? PMD: Yes. And in the part where I am, which is completely stuck on a limb all on its own on the end of a long road of about five miles, there are one…two…three…four…five…six including me. DB: That's remarkable. That doesn't seem to jibe with the life of the jet-setting conductor and composer. PMD: That's right. Well, it’s a sort of frantic time. I’m not all that jet-setting anyway, but when I come to London, I’ve got this little flat here. It's a springboard for traveling about like in one day’s time, I go to Israel conducting with the Jerusalem Orchestra and then to Los Angeles and back - and then to Orkney and then I’ve got some recordings to do Glasgow and, I think, Zürich - I can't remember. But so it goes on. And then I have a period of a few months where I am in Hoy and I am writing music. DB: How much time do you spend in Orkney? PMD: Normally about six months of the year. DB: Let me ask you about your life as a conductor. A symphony conductor. PMD: (Laughs). Well, I’m laughing at you because this is all by accident. I’ve got no ambitions as a conductor, really, except that having done it, I do sometimes quite enjoy it. I conducted the Fires of London, but (once) James Conlon couldn't do a date with the Scottish Chamber Orchestra, so I took it over like at a minute’s notice. He had some - I don’t know - emergency came up and I was just doing something of my own - a recording it was. That's right! A recording of a piece of my own. So I did that. And they said, “Well, would you do some more?” so I did a bit more. And then it turned out that somebody couldn't conduct a concert, so I did some Mozart. And then somebody else couldn’t conduct in Orkney, so I did the Royal Philharmonic Orchestra in a concert with Beethoven's Seventh Symphony among other things - again, always doing it at a few days notice. And then just quite recently, at the Edinburgh festival, somebody fell out of doing a concert with the Scottish Chamber Orchestra. So I found myself doing the “Eroica” Symphony. It seemed to go very well, some I’m getting asked to do the “Eroica” Symphony and various other things quite a lot. DB: Including here in Los Angeles, we’ll get to hear your “Eroica,” I guess. PMD: (Laughs). Well it all makes me laugh because it's all by accident, but I must say it's very enjoyable. DB: I see. I thought you were following in the footsteps of Pierre Boulez. PMD: I’ve got no such ambition. I do a bit of it because I enjoy it, but more than that, I don't want to. I must keep those six months of writing music because that's primely what I'm about. DB: Does the conducting bring anything to your composition, to your growth as a composer? PMD: I think it does. I think it's very essential for a composer to interact with musicians. I always did have that working with the Fires of London and working with conductors, with other orchestras and opera houses or whatever. But actually doing it yourself, I realized pretty late in life, it's a very, very constructive thing. You hear all sorts of things. You’ve got a responsibility. It teaches you. It’s the best composition lesson ever. I remember a few months ago when I found myself conducting a Mozart symphony for the first time in my life - it was the “Prague” Symphony. In one of the performances - it was the second movement - I thought, “My goodness! This is actually as if I'm composing this as I go along.” One had that illusion at the moment, and I found myself listening to this piece in a way that I'd never done before. I think it was the best composition lesson I ever had - that particular performance. DB: Hmm. That's very insightful. You've been conducting for the last couple of years now? DB: Well, I think our time is up. I want to let you get on to your next engagement. PMD: Oh, I’ve got no engagements today. Don't worry. I’m just sitting here - I’m doing the “Jupiter” Symphony next week - I'm just sitting here with the score of that. I'm enjoying it.